Outreach and advocacy is a very important part of what we do. We know that what we do is important and serves several purposes, such as documenting the school’s history and supporting the teaching mission of our institution. However, those not actively involved with the archives often ask why the school might have an archives, or might think that “it’s a nice thing to have but it’s not essential to the development of the school.” One of our tasks is to inform all of our user groups of why the archives is important. Our core user groups naturally include the alumni, the Development Office, or the Communications Department, but sometimes we may not get a chance to reach out to the parents of current students. Screenshot of one of the panels in the Introduction to the Archives lecture. From the collection of The Westminster Schools Archives, Atlanta, Georgia. I am assured of receiving the PTA records in a timely manner. The archives is seen as an active and vital part of the school. Parents have encouraged their students to come and visit the archives–I have had several stop by “just to see” the archives. Parents have contacted me with reference questions or have donated items from their personal collections at home. Several parents came up to me after each presentation to tell me that they were alumni, and either did not realize that we had an archives or thought we only had the yearbooks in our collection. Now, at other functions, several parents will come to me to say hello, and I am getting to know them and their students. Becoming an integral part of the community is an asset for any archives. Note about the picture: One of the Archives’ most popular exhibits takes place right at the beginning of the school year in August–the annual “Alumni Parents” exhibit. 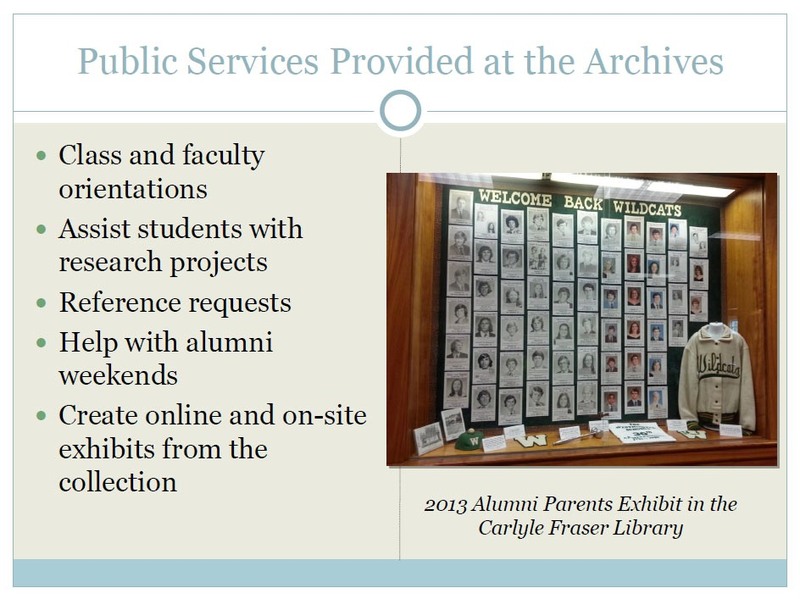 We identify the parents of graduating seniors who went to the school–whether they graduated or not–and post their senior photo in the Carlyle Fraser Library. This year we included a senior quote, if one was printed in the yearbook, as well as some photographs and artifacts from the Archives. As I was installing the exhibit, I was often crowded by students surrounding me, looking for their parent (or parents’) picture. Many parents also stopped by to see the senior photos of their friends. It was a good way for me, being new to the school, to get to know the collection more in depth, to start learning names of alumni, and to chat with the community about the importance of archives. Four archivists' battles with masses of legacy description. a mutual aid and study group for those in the archives and associated professions.